It has a number of elements that are identical to the piece in question such as: insects assuming control of the earth, man's destruction of the planet, insects' adaptations and potential to survive human-created catastrophes. I recently found a sci-fi drama series of 1959 entitled "One Step Beyond" which features plot twists with some similarity to Twilight Zone, however I did not find any episodes that correspond to the piece in question. It doesn't seem that there are any corresponding stories in that series, yet I would like to view at least one episode. If anyone can point to a video it would be greatly appreciated. As I continue to catalog various movies and TV series it has been very helpful in keeping track of ground already covered, so I will continue to document any potentially related material here for reference. This story has an interesting twist in that man is to be replaced by techno-literate termites. This could possibly fit the scenes of the piece I saw which showed enlarged termite-like creatures seemingly taking control of human creations (houses, cars, etc.). After carefully viewing this compilation I can say with certainty that the piece I seek is not an episode within that series. Out of the Unknown does have some element of the surreal in it, but it's primarily drama-oriented and doesn't fully engage the surreal element like the piece that I seek does. Apparently France has produced a minimal number of sci-fi movies. While the list below is likely incomplete, it probably represents the bulk of them. I didn't find anything close to the piece in question though I did think that with movies from the 50s and 60s such as J. Tati's "Mr. Hulot on Vacation" and their minimalist dialog and unique POV an almost-silent movie about a termite-like creature invasion would not be far off at all. If I understood French I'm sure I would have enjoyed this movie, however its another small piece in the puzzle of re-creating the movie or show I'm looking for. Of the sci-fi/adventure/futurist/horror/mystery series made in England during the 1960s and 1970s that I searched, only this series shows some promise in terms of finding a possible match or clue to the piece in question. However its been removed from You Tube and is only available in DVD form (from BBC, I believe). Of the episodes that might be of interest, one in particular stands out: "The Uninvited." If anyone can offer links to episodes from this series it would be much appreciated. I cannot find any episodes of "Out There" on You Tube or similar video sites. If anyone can point me to one or more episodes it would be very helpful. After reading through the story summaries of the episodes from the list below which I have not yet seen I can firmly conclude that the story I am seeking is not among them. I had not viewed episodes of the "Way Out" series so I watched several and while they are interesting they are very far from the mood of surrealism that pervades the movie or episode I look for. I am even more certain now that the pieces in question is a movie as opposed to an episode of a series since the surreal mood, scenes and creature behavior would take longer than an hour to develop, especially based on the slow pace of the scenes that I recall. If anyone following or participating in this question would like to help feel free to choose a series (or more than one) and go through the episodes and check for any possible matches. You might want to re-search some of the series that I have already checked. Because Alfred Hitchcock's TV series are within the 50s-60s time period, in black and white and can be a bit surreal I searched both runs of his shows. Virtually every one of his episodes involves a murder or other criminal mystery without a hint of sci-fi, though there is an undercurrent of horror. I could not find even a hint of a match. After thoroughly searching the IMDB list of Mexican horror and sci-fi films of the 1950s and 1960s I can be certain that the movie or episode in question is not of Mexican origin. As with English sci-fi/horror of the same period, it seems that those two particular sub-industries in those two particular countries started off with a scant few titles. In particular, the scenes of termites moving in groups bears a striking resemblance to the scenes that I can recall from the movie or episode in question. 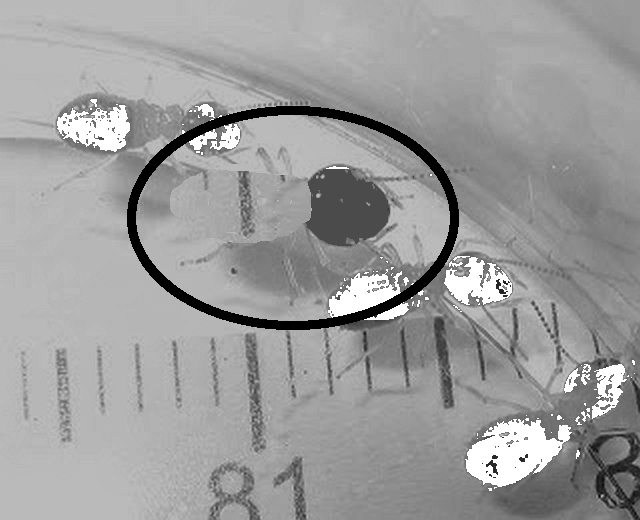 If the size of the termites were enlarged to 6-8 inches, their color shifted to a dull metallic gray, and their movements slowed to about 1/4 their real-time speed, the resulting footage would almost mirror what I can recall from many years ago. This is the closest I can get to the actual footage of what I originally saw without spending several months creating 3D models of the termite creatures and animating them for a short piece to briefly illustrate a glimpse from a scene. There are many parallels between this movie and the movie or episode I am seeking. The first and foremost of which is the plot, which gives the insects purpose. In the piece I'm seeking the basic story is unclear though its likely to revolve around a very similar theme. Depending on the origin of the termite-like creatures I describe in detail below the plot could be anything from a near match to something roughly similar. The massing and swarming of the insects in "War of the Insects" also parallel the action scenes in the piece I'm seeking. Some specifics, such as the hornet or bee-like insects in that move have much in common with what I'm seeking, though it seems that real bees or hornets were used along with stock footage of the same, whereas the piece I'm seeking likely employs stop action models. "War of the Insects" has several surreal moments though for the majority of the piece it maintains a typical doom-and-gloom atmosphere since the movie terminates with the detonation of a nuclear bomb. Nevertheless, here is another clue in the identification of the piece in question. I checked a list of English sci-fi series of the 1950s and 1960s and found absolutely nothing related to the piece in question. Apparently sci-fi series in that country were few in that time period. Unless there are some very obscure series not found in the usual lists, my conclusion is that the piece in question is either American or non-American with dubbed English dialogue. That's still a very wide field to cover so if anyone from England, such as a commenter below would like to search 50s-60s sci-fi TV show archives at universities and public libraries for this piece, it would be very helpful. 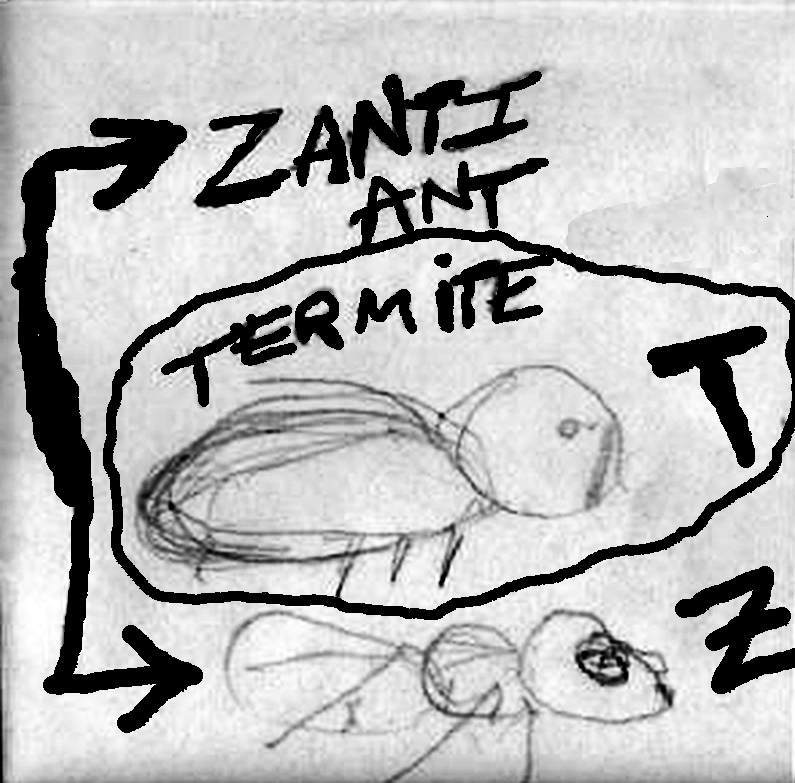 Below is a quick and rough sketch I made several weeks ago of the essential form of a Zanti ant creature vs the termite-like creature which is featured in the piece I'm seeking. While the sketch was executed with rapidity I can say that the essential forms of the two fictional creatures were captured to my satisfaction which relies on distant but distinct memory. I find that some of my memories of this piece are fading and any drawings or notes are important to maintaining my recollections. You will note the considerable differences between the two creatures which upon study would not be mistaken. Likewise, the two stories are equally distinct. Since my sketch was done with pencil I enhanced the clarity of the scanned image and touched up the hand lettering. While this particular segment is short, so is my memory of a very similar scene in the piece I search for. Also, this scene is from the approximate date of the show or movie I'm seeking and its in black and white with something of a surreal tone to it. However the filming is very sharp and clear unlike the piece I'm searching for which had a hazier look. As for the action, the only missing element would be the termite-like creatures I described below, which would be attempting to enter the vehicle. This clip is now the closest actual material I have found to the scene in the piece in question. Hopefully this will ring a bell for some of the vintage sci-fi enthusiasts who visit this site. My attempt at re-creating a bit of the mood of the piece in question was limited by my image editing skills and available time, yet it no doubt projects a different feel from the much more realistic photo in an entry below. From my memory I can clearly recall that the creatures were a dull to slightly metallic hue depending on the lighting of the scenes, so if you can project that onto my modified image in your mind you may momentarily transport yourself into the realm of the piece in question. Sometimes a brief entry into the twilight zone or a night gallery may be helpful. Though this is very roughly parallel to the show or movie I'm after, any material that is even remotely related can prove helpful. Through discussion and reflection, it has occurred to me that the program (movie or episode) that I viewed almost 40 years ago could be a British or other foreign creation. If you read through this slowly enlarging "question" you will note that I mention numerous times an eerie, slightly surreal atmosphere that was established and maintained in what scenes I can recall. I have not often found this atmosphere in US American productions, and I was born and reside here. I have viewed many productions from around the world and have found that this type of atmosphere is much more common in foreign pieces than in US pieces. This particular mood also tends to be accompanied by minimalist dialogue, something that is uncommon in many US sci-fi productions. In the comments below another appreciator and seeker of obscure sci-fi pieces mentioned that its likely the piece I seek is exactly one of those rare birds. I concur, and further, suggest that any and all whose curiosity is piqued by my inquiry review their memories for any foreign sci-fi movies or shows that have anything in common with my list and other descriptors below. It would also be helpful to consider any US-made pieces that did not conform to the common moods and themes prevalent in American productions. I have seen at least several European movies and other pieces with virtually no verbal dialogue whatsoever, and this "silent treatment" of the viewing audience is something both striking and at odds with American sensibilities, this giving me reason to now suggest the pieces in question may likely be foreign (or very obscure American). Zanti Misfits: a current model luxury car is seen with an ant on its roof. In the show or movie I look for the termite-like creatures are actively crawling on the windows of a similar car, terrorizing the female occupant who runs the windows up just in time to keep the termites out. Zanti Misfits: The alien ants arrive in a typical alien saucer-type space ship. In the show or movie I seek, no space ship is shown. The termites are free ranging and seen across a wide, open area unlike the Zanti ants. Zanti Misfits: The ants are seen sliding down an old stained glass window. Apparently the stop-action movements were too involved so the figures were simply lowered on a string. I found this to be a cheap shortcut that detracted a lot from the overall story. In the show or movie I am trying to find, the termite creatures were walking across what I think was a glass block wall or window of a house. Several termite creatures were shown at once and each moved in the same manner as in other scenes. This added considerably to the eerie, surreal mood that had been set. Zanti Misfits: The Zanti ants have a jerky, twitchy type of movement, similar to real ants. The termite creatures had a smoother, slower gait similar to real termites. Zanti Misfits: The ant misfits could speak their alien tongue but we never saw them actually speaking. They opened their human-like mouths but never spoke. We only hear them through a receiver speaker and their English was via computer translation. The termite creatures do speak, however, and in English with a metallic voice - no translation necessary. They are not wordy and their speech was slow, again adding to the surreal nature of the atmosphere created. Zanti Misfits: The Zantis that arrived on earth were simply a small group of convicts or prisoners. They were accompanied by guards and the Zanti leadership spoke for them and gave orders to the ship's guards as to what action they would take, up until the prisoners decided to escape. The termite creatures I saw had no central leadership and therefore were not following direct orders. Apparently their massing and roaming was a group behavior and had nothing to do with any kind of higher authority. Zanti Misfits: The Zanti prisoners focused their attack on the old building in which US military officers made their headquarters. The prisoners were not attempting an invasion or takeover of the planet - they were attempting to escape and eliminate their new jailers on earth. The termite creature, however, seemed to be roaming about in numbers in an attempt to subdue or control (if only out of fear) the human race. Zanti Misfits: The entire episode focuses on a ghost town in CA and the surrounding terrain, which includes a high rock hill with many outcrops and other rock formations. What I recall of the piece in question is that it took place in an open plain, likely in CA but the location also could have been in UT or NV as the terrain seemed dry with minimal vegetation. Zanti Misfits: One of two criminals in an automobile gets out and walks up the rocky hill described in #8. He peers into the Zanti ship and then chased and attacked by a solitary ant. He rolls down a rocky incline and seems to be stunned as the ant crawls up his arm. No such attack takes place in the piece I'm searching for. The termite-like creatures seem to be more intent on frightening humans - part of the eerie, surreal atmosphere created as opposed to the tense standoff and brief but hectic confrontation in Zanti. Zanti Misfits: The ants emit an insect-like buzzing sound as they approach or attack. They do not speak though they do open and close their mouths. Only the unseen Zanti authority figures are heard speaking. The only other sound emitted by the Zanti misfits is a high-pitched shriek or shrill cry as they are killed. The termite-like creatures make no sounds or noises as they move and are only heard speaking on two occasions as they confronted trapped humans (one in a car and one in a house). Hopefully this list will help differentiate the show or movie I'm looking for from Zanti Misfits so anyone with memories of it may recall some of these specific scenes. The particular individual I'm referring to is the second from the top and with the large head. In the clips that I can recall the creatures looked very much like this termite but in a dull metallic color and with some simplification, but its the closest I could find. At this point I can add a rough summary of the movie or show I'm searching for as opposed to the silhouette below that I've patched together with comparisons to scenes in other movies. 2) A story that centers around a massing of termite-like creatures. The creatures are unnaturally large for their type being approximately 1ft or 30cm in length and they are a dull metallic color. They walk on short legs with a slow, steady gait unlike longer-legged ants or other insects with rapid, erratic motion. These creatures can also vocalize the English language and there are scenes where they speak to humans they are attacking. Its not clear whether they are aliens, mutants, or some form of life-like robots. They have simple heads with no human features and were able to tilt and swivel their heads. a) The creatures terrorizing a human in an automobile and actively attempting to enter the car. b) Terrorizing a human in a house in a group of a dozen or so. The creatures crawled across windows and on the outside of the house. There were close-up shots of them actively moving singly and in groups. Again, their movement was slow and steady. The human in the house was sitting on a chair or sofa in fear. One creature seemed to have slipped into the house and spoke to the man in the chair or sofa in a metallic voice. c) Scenes of the creatures massed, being attacked and of individual humans speaking urgently with each other. These scenes are unfortunately very faint for me though they are definitely associated with the piece in question. I also recall some action scenes where the creatures were being attacked with possibly military weapons with fire and explosions among the creatures. The above is my most complete recollection to date though with time more may surface. This question is till open and unanswered since I haven't been able to offer the right clues and hints - yet. However after viewing many alien or mutant insect movies the closest I could find yet would be Phase IV (1974). Being in color and from the 1970s separates is from 50's and 60's sci-fi in many ways, though the plot is what matters. Discarding the details, the plot is about alien or mutant ants with a higher level of intelligence or mental development than humans. Naturally in this genre the attacking aliens or mutants plan to take over the earth and in Phase IV, they preempt every move the heroes make and even communicate to the humans through their tactical moves what they are thinking and planning. The human heroes end up in a sealed dome where they struggle to find an answer. The ants almost taunt them and there is a scene where one of the people in the dome plead with the ants to leave go away. This summarized plot and story seem very close to the older movie or show I'm looking for without the look and mood of the 70's sc-fi style. Also, footage of real ants was used in Phase IV whereas what I'm looking for used models of termite-like insects. 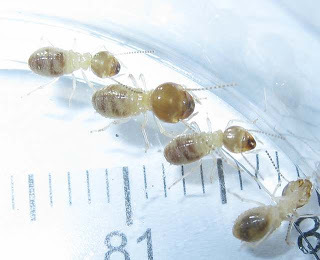 The termite-like (or small ant-like) creatures are very deliberate and even talk to the humans trapped in a house or shelter as they enact their plan. This produces a very eery surreal mood as in Phase IV even though one uses special effect creatures and the other special footage of real ants. Unfortunately I can't recall anything about the ending of the movie or show I hope to find but now I believe I have the core of the story summarized. While Zanti Misfits has some similarities because of the size and type of creature, the entire plot is based on suspense and a quick resolution which is different than the slow deliberate plot of Phase IV and what I'm after. It is possible that Phase IV is a take-off of the older movie or show I'm seeking. Phase IV was not a popular movie at all and it is the type of movie that is open to interpretation. What I'm looking for is much the same and at least Phase IV is a good reference point. I just finished up my own search of The Outer Limits and found the old episode "The Zanti Misfits" (S1E14) which was one of the shows I have been looking for. After viewing it several times it occurred to me that there is another show/movie I had seen that had similar elements in it to "The Zanti Misfits" but I had no clue as to where to look for it. "The Zanti Misfits" has a militaristic theme and military elements that the show I am seeking did not have. The shop on the main street of the ghost town in "The Zanti Misfits" that was used as military headquarters was not in the show I am seeking. There were ant or termite-like creatures in the show in question however they did not have human faces and they spoke to the humans they encountered. These creatures seemed more robot or machine like than the Zantis and outside of the house they were attempting to enter were many more roaming about than in "The Zanti Misfits". There were no humans in uniform and the part I recall seemed to have only one or two people as opposed to the many officers in "The Zanti Misfits". The interior of the house was modern '50s or '60s style as opposed to the 19th century look in "The Zanti Misfits". There is a scene that is similar in both shows: the hostile creatures climbing up (or down) a window to build fear and tension. However the "The Zanti Misfits" scene featured the Zantis sliding down a stained glass window whereas the other show had the creatures seemingly walking up glass block or something similar. There was also a scene with an automobile as in "The Zanti Misfits" but the creatures were not sitting on the roof of the car. They were attempting to get in the vehicle and many more were moving about outside the car. In "The Zanti Misfits" there is only one Zanti ant attacking and it was waiting on the roof of the car as opposed to trying to get in. I began looking through Twilight Zone episodes since it's a logical fit, but there are about 160 episode so I tried searching for what I described above but no similar story seems to exist in the series. It's more probable that the show I seek is a movie about some kind of alien invasion. It's possible that my 30-some year old recollections of a Sunday afternoon re-run have melded elements of "The Zanti Misfits" with another show, however my recollections of another show are still clear after all that time and I'm sure that there is something else that will fit my description. I looked into all of the stories involving ants and other insects but simply haven't found my show but I'm sure it's out there. After allowing some time for the resurfacing of my own recollections I added some relevant comments that may now offer enough material for someone to make an ID. The central plot of this movie or show could have been about mutation and/or invasion. I can't recall enough of the original to say which it might be but it could be either. I do recall that there were some fight scenes with weapons, which unlike ZM was not restricted to a particular location. I recall that the mood and filming of the movie or show I'm looking for was quite different from Zanti Misfits. The overall look was hazier and the mood was more withdrawn and impassive. If it is a movie, the scenes with the large (maybe 1ft long) termite-like creatures were a smaller part of the movie. I checked every Twilight Zone story and its not there. I also checked the stories of several of the 50s and 60s science fiction series made in the US and England. Again, not there. Those series and other movies of the period all had story lines of the "problem-solver" variety: A threat would arrive and strong-minded characters would start seeking a solution. What I'm seeking seemed to have a dreamy or slightly surreal aspect to it. I can recall the characters reacting with fear to the large termite-like creatures (or robots) but it wasn't intense as in most monster or alien movies. Before posting this answer I searched through all sci-fi movies listed in the IMDB pages on sci-fi movies of the 50's, 60's and early 70's. I also read every plot of the original Twilight Zone series and of several sci-fi series of the 1950s. As a result of this search one thing I realized is that most shows and movies of the above period had more of a problem/solution utilitarian story line than the show in question, which had a dreamier quality to it. There was the usual problem of aliens or mutants threatening humans but without the usual urgent and/or militaristic solution dominating the story. This gave it a more elusive quality and thus makes it harder to recall and ID. After the 1:45 mark begins a clip from Zanti Misfits for what reason I do not know. If the movie shown in the first 1:45s can be identified it may be the movie I'm seeking. Another clue is the Outer Limits trading card with one side showing strange ant-like creatures with human faces (not resembling the ones in Zanti Misfits) and the opposite describing a plot for a movie or story that fits with what I've described in my question, yet there is no other episode of Outer Limits with enlarged ant creatures. Not the answer you're looking for? Browse other questions tagged story-identification aliens robots alien-invasion or ask your own question. Gargoyles (1972) - A different ending?